Are you looking for a unique gift that sends a message? Instead of sending someone flowers that will last a week and then die, Sock Grams has an unusual idea…send fun and funky socks! Everyone can always use another pair of socks! She’s got the whole world on her foot with these Global Warming Socks. 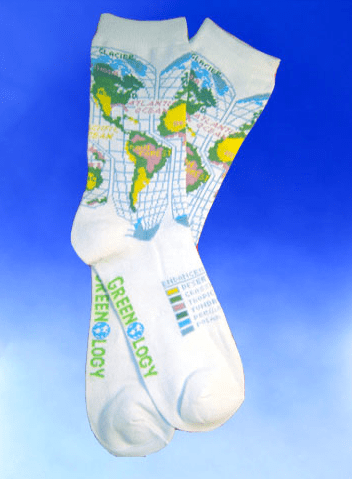 These socks point out endangered climates and areas such as the Polar Ice Cap and the South American Rain Forest. 80% Bamboo, 17% Polyester, 3% Spandex. Fit size 6-9 1/2. Sock Grams come with a card and a packet of stickers or sample size of body creme/balm depending on if the socks are for an adult or child. This is a unique gift idea, especially for those that love fun and funky socks.